Republican Roy Moore, an evangelical Christian running for an Alabama senate seat, has been accused by four women of making sexual and romantic advances toward them when they were in their teens and he in his early thirties, reports the Washington Post. One woman said he sexually propositioned her when she was just 14 (he was 32). Moore initially dismissed the accusations as a “baseless political attack.” Despite Roy’s own shaky defense when he spoke with Sean Hannity on Fox News radio—he said he doesn’t “generally” remember dating women as young as the accusers, for instance, but then claimed he always had their parents’ permission when he did—many in his party have been supportive. 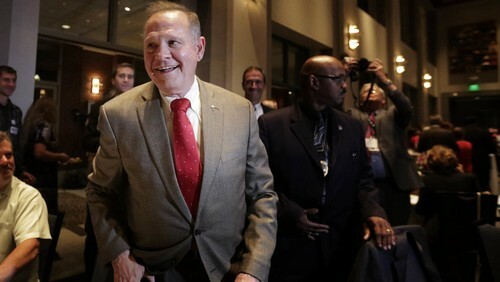 Today (Nov. 11), when Moore appeared at a GOP meeting in Birmingham for the first time since the allegations surfaced, he was met with cheers and applause. However, an increasing number of Republican senators and members of the party are calling for Moore to step aside anyway, either suggesting he be replaced by his primary opponent, or even that losing the election might have better long-term consequences for Republicans than electing Moore. Barbara Comstock and Carlos Curbelo, Republicans running in Virginia and Florida respectively, have also called for Moore to leave the race. Another option, suggested by Adam Kinzinger, Republican senator from Illinois, would be to expel Moore from senate even if he were elected. But many—including prominent evangelical Christian representatives—have stood by Moore. Like Moore, some have rejected the accusations (paywall) as a smear campaign. Steve Bannon, former advisor to the president, blamed the media for surfacing the allegations, and said he’d stand by Moore until further evidence of his guilt was found. Alabama Republican strategist Jonathan Grayclaimed state pride. “[Alabamians] don’t take kindly to people from outside our state coming down here and telling us what we should do,” he said. Many Republicans said that Moore should step down from the Senate race and that the allegations were troubling—”if true.” Washington isn’t taking notes from Hollywood, where multiple allegations against Harvey Weinstein, Louis C.K., and others have resulted in quick shake ups. Donald Trump, himself not a stranger of sexual misconduct accusations, believes “that if these allegations are true, Judge Moore will do the right thing and step aside,” according to White House press secretary Sarah Sanders. A few Republicans went even further, saying they would support Moore even if the allegations turned out to be true. Alabama’s Geneva county GOP chairman Riley Seibenhenersaid that “other than being with an underage person [Moore] didn’t really force himself,” and though that’s bad, supporting him is a better choice than asking him to withdraw.